The working group on private premises and urban revitalization of Sham Shui Po District Council commissioned SEE Network to review the Operation Building Bright Scheme (henceforth shorten as The Operation). This study looked into the policy background and context of The Operation, and evaluated its implementation result. The study team also conducted interviews and survey with private premise owners, collected their experiences of joining the scheme, their comments of it and expectation of support needed when dealing with building maintenance. 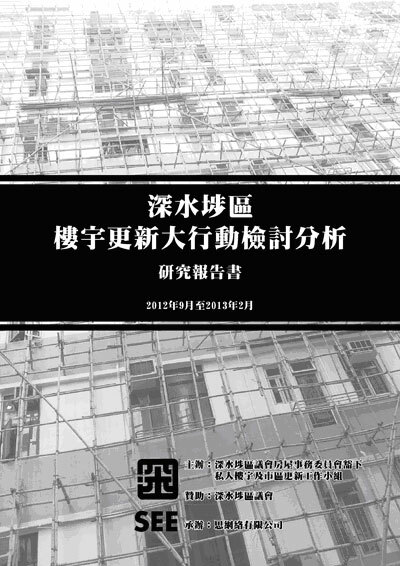 The report analyzed the policy issues and made recommendations on related supportive policies regarding building maintenance. 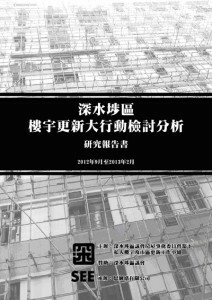 This report provided a detailed description of the establishment background of Urban Renewal Authority, the origin and development of the Urban Renewal Strategy, as well as evaluated its implementation and results. During the period, a public forum and street exhibition were held to educate public about their rights under urban renewal. 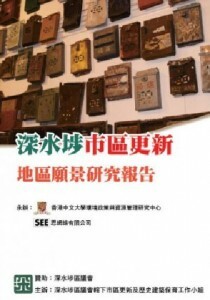 Sham Sham Po District Council commissioned Centre for Environmental Policy and Resource Management of the Chinese University of Hong Kong and SEE Network to conduct this study. The research team adopted a qualitative research approach with in-depth interviews with 108 stakeholders within the district. 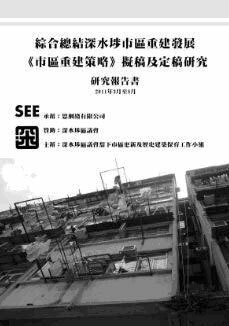 They shared with the team about their living patterns, personal background and their experiences with urban renewal, and from which the research team was able to generalize the characteristics of Sham Shui Po as “a convenient living area with diversified choices”. The study also identified the shortcoming of the then urban renewal policy and provide recommendations for future policy formulation. 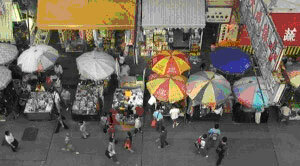 The study aimed to collect opinions of the stakeholders on the feasibility of building a new wet market near Hoi Lai Estate. The research team also did site-visits to the public wet markets within the district and conducted survey with its patrons to identify the problems of the existing wet market. The study concluded some critical factors that made a wet market successful. It also provided recommendations on wet market planning in future.